Ghanaians seeking to replace or acquire new passports would have to wait a little longer as the passports office located at Ridge in Accra has been closed down. The facility has been closed to the public due to an electrical fault that has affected the offices’ printers. Citizens who visited the office to transact business on Tuesday were turned away by policemen manning the gates at the premises due to the situation. Although officials are treating the situation as an urgent one and working to ensure regular work resumes, that will not be until Friday. The Deputy Minister for Foreign Affairs, Habib Tijani, told Citi News that the wiring and fire systems at the office are currently being fixed. A survey conducted by the Ghana Integrity initiative anti-corruption Consortium in 2017, identified the passports office as one of the few government agencies where bribery and corruption is pervasive. The survey, which was to assess citizen's understanding of corruption, their perceptions and actual experiences of corruption, show that Ghanaians still perceived the passports office as well as the police service, political parties and the judiciary as being corrupt. It however revealed that Ghanaians do not regard the payment of what is commonly called facilitation fee as a form of corruption. 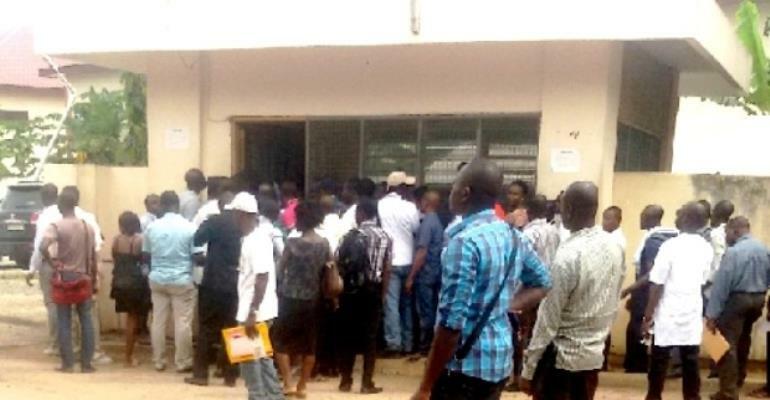 Despite promises by successive governments to improve the process, many Ghanaians are forced to pay bribes, pay exorbitant charges through middlemen popularly known as 'gorro boys' or queue as early as 3:00am each day to have their passport applications processed especially at the Accra application center. The forms for regular application currently goes for GHS 50, and are expected to be processed within 4 weeks, whilst the forms for express applications are being sold for GHS 100, and are expected to be processed within 2 weeks, although the duration may slightly vary.